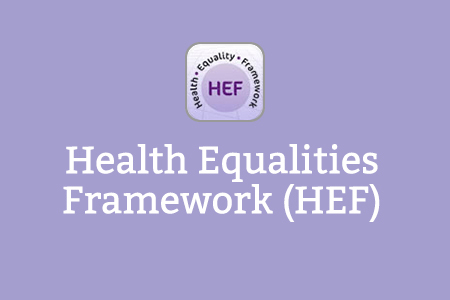 The Health Equalities Framework (HEF) e-learning resource is designed to provide practitioners with a practical introduction to the Health Equalities Framework tool, along with an understanding of the health inequalities experienced by people with learning disabilities, and the reasons or determinants of those health inequalities. The programme is delivered through a partnership between the Learning Disability Nurse Consultant Group, the National Development Team for Inclusion and Health Education England e-Learning for Healthcare. If you already have an account with e-LfH, then you can enrol on to the Health Equalities Framework programme by logging in to the e-LfH Hub, selecting My Account > Enrolment and selecting the programme. You can then access the programme immediately in the My e-Learning section. The Health Equalities Framework programme is also available to NHS healthcare staff via the Electronic Staff Record (ESR). Accessing this e-Learning via ESR means that your completions will transfer with you throughout your NHS career.